It’s time to stop thinking about the Internet and online communication in the context of a device, be it desktop, tablet or mobile. Advances by Google and Apple have heightened consumer expectations, which now require stricter focus from us to create seamless online communications — communications that work everywhere and that get their point across. We need to embrace a device-agnostic approach to communicating with connected consumers and forget the idea of a “mobile Internet”. There is only One Web to experience. A common argument against a seamless One Web experience is that mobile is all about context or, more specifically, location. This is somewhat true: it is about location, but it’s not all about on-the-go location. This classic use case leads many to believe that the only information people want on mobile is action-oriented on-the-go information. The truth here can be delivered in three parts. Across the world, accessing the Internet on a smartphone is most commonly done at home. Other popular location-related contexts are “on the go” and fixed locations such as work, cafes and shops. When it comes to the content of your communications, the insight here is that there is really no insight. Your user experience must cater to people in different locations. So, what do people in different locations have in common? They have a need for your information, to know what you do. How different does that need to be from location to location? Not very much. One could argue that the websites people visit at home are different from the websites they visit on the go. This leads us to the second important truth about the on-the-go context. Just because people are in transit doesn’t mean they are in a hurry. Nor does it mean that the information they are browsing for correlates in the slightest with their location. This is why Google (as early as 2007) aptly identified three mindsets for mobile, which one could argue are true of any interaction with a device. These mindsets are “bored now,” “repetitive now” and “urgent now.” Each is pretty self-explanatory. What is truly relevant is not whether someone is on the go, but what state of mind they are in when interacting with the information and how that affects the information, its format and its structure. A common data set used to show that mobile and desktop users have separate needs is the top-task analysis. Here, one looks at analytics to see what tasks are most common among users on a desktop computer. 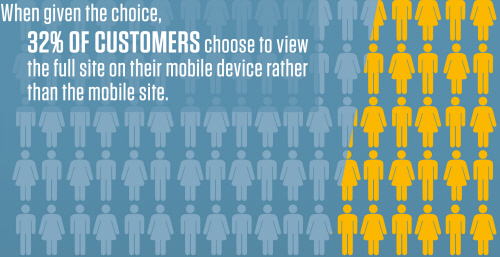 Then you’d do the same for mobile visitors. Voila! Now you can put together a list of different tasks for different visitor types. This kind of research can be extremely valuable in answering questions about prioritization and in guiding the interface and UX design. It does not, however, prove that information should be different for different devices. This is because the data is tainted by pro-desktop user interfaces, non-touch optimization, clunky information architectures and slow loading times. One Web experiences are about creating communications that speak to different mindsets, not to different devices. People need to be able to find various pieces of information, and they expect that the information will be readily available whether they’re on a phone or desktop computer. So, we can no longer get away with treating a website like the cupboard under the stairs where we throw all of the stuff that has nowhere else to live. Strategy must guide sharp and focused communication — communication that informs, persuades and provides the next step towards your business goals. The One Web sets extra (surpassable) challenges for us to create interfaces and experiences that are recognizable and recollectable across devices and that are structured for the mindset of multiple interactions that people have. None of this is a new requirement for brands. Focus isn’t really a new requirement for our “new digital world” or anything else. It’s basic business and marketing. That many have gotten away without it has been a temporary glitch. And that is now being amended. It’s time to recall Mark Twain’s wisdom and to take the time to do online communication properly. The positive side effect of designing online communication in this way is that it eases the pain of having to create and manage all of the content that multiple websites and platforms entail. Whereas today most mobile and tablet websites run different content, content formats, specifications and even CMS tools, tomorrow will be something else. Mobile short isn’t about providing less for mobile. People want just as much on mobile as anywhere else. But when “short” works on mobile, should it not also be enough on a desktop? An SMS, a tweet, a headline — they often say enough, and sometimes say a lot. David Ogilvy famously said, “On the average, five times as many people read the headline as read the body copy. When you have written your headline, you have spent eighty cents out of your dollar.” Granted, a headline alone is rarely enough, but if a piece of strong concise communication works for mobile, why should it be less concise anywhere else? Expectations across all devices are converging. With mobile users wanting more, it may be an opportunity to review how our desktop formats can do just as much with less. While strategy and UX design need to align, a great number of finesses are still needed to make the One Web experience possible. These include things such as understanding the different ways that touch interfaces work, how to architect and structure information on tighter screens, how to scale things up, and how to code around a technology’s capabilities. Knowledge of this can be found in your interaction designers and developers. You’ll also need to get to the heart of your offer, your product and your brand and learn to communicate it in a way that creates and fulfills demand. This is the work of your strategist and copywriter. It’s no surprise that Google itself is extremely strong in this area. A great example is The Mobile Playbook, which has a great deal of content and whose UX design is tailored to mobile, tablet and desktop devices. All of these are reasons why the approach of building mobile first is so hot right now. If you start thinking about your Web experience from a mobile standpoint, you will be forced to devise and create a sharp, focused communications strategy and UX design that cater to multiple interaction mindsets and user goals. Once you have these fundamentals in place, it will be much easier to scale up to other devices, which in turn will inherit this focused thinking, helping to create a One Web that is intelligent, useful and worth experiencing.